Review an example of the non-profit scorecard: learn how nonprofit organizations can use the Balanced Scorecard framework, find out what objectives and indicators should be mapped in the financial perspective. Recently I was approached by an executive director of a nonprofit who asked me about the possibility of the Balanced Scorecard implementation in their organization. His biggest concern was about the financial perspective; and for sure, most standard financial indicators were not applicable in their case. Nonprofit Balanced Scorecard online - sign-up with a free account for immediate access to 16 scorecard templates. In this article I’d like to show how government and nonprofit organizations can adapt the Balanced Scorecard approach, and what to do with the financial perspective of the BSC. As always, a good example will help to illustrate my points. 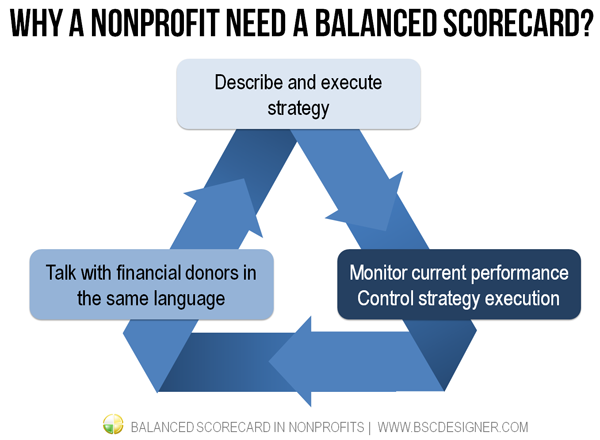 Why do nonprofits need the Balanced Scorecard? First of all BSC helps to describe a strategy, focus actions on what matters, and finally execute the strategy successfully. For sure, some nonprofits might face problems with an articulation of the strategy, and so following the Balanced Scorecard approach helps to frame thoughts about strategy in the right way. Many donations to the nonprofit organizations are made by for-profit companies. Executives from these companies use BSC for their strategic planning. In this sense, non-profits that have a strategy described with a Balanced Scorecard have more chances to get funding, as they are talking with financial donors in the same business language. Where should nonprofit place a Financial perspective? In most cases, for-profit organizations agree (see the workshop exercise) about the order of the BSC’s perspectives: 1. Learning. Within the nonprofits, there is no such agreement yet. The logic here is to put the most important long-term outcome (which, in the case of nonprofits, are not financial outcomes) on the top of the diagram. Robert S. Kaplan in his article recommends nonprofits putting long-term mission objectives (like “reduction in poverty, diseases, pollution”) on the top. 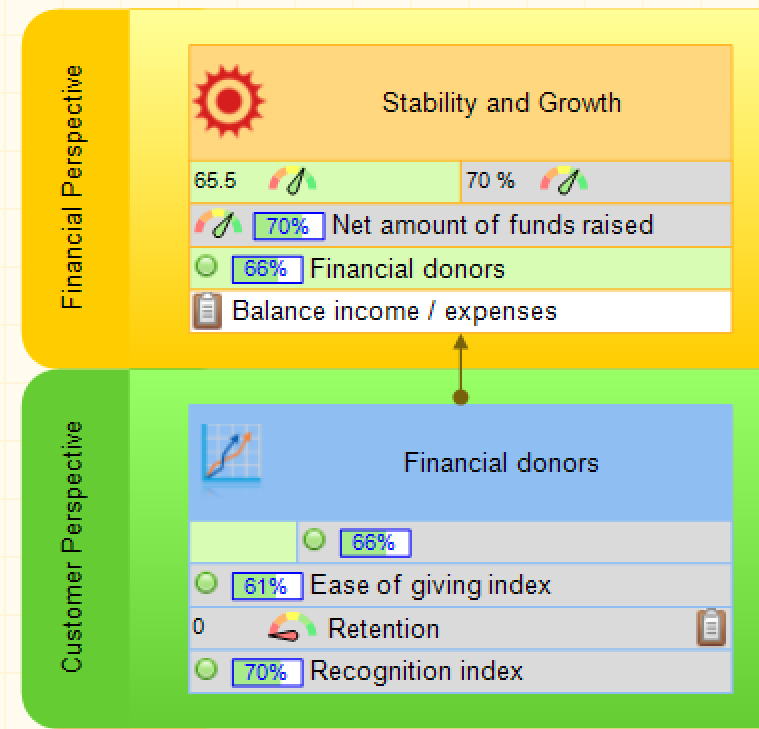 In some scorecard I saw financial perspective was located on the bottom of BSC diagram. Managers in such organizations treat finance as a resource and don’t want to have it on the top. The problem with this approach is that it will be hard to track the cause-and-effect logic of such BSC. 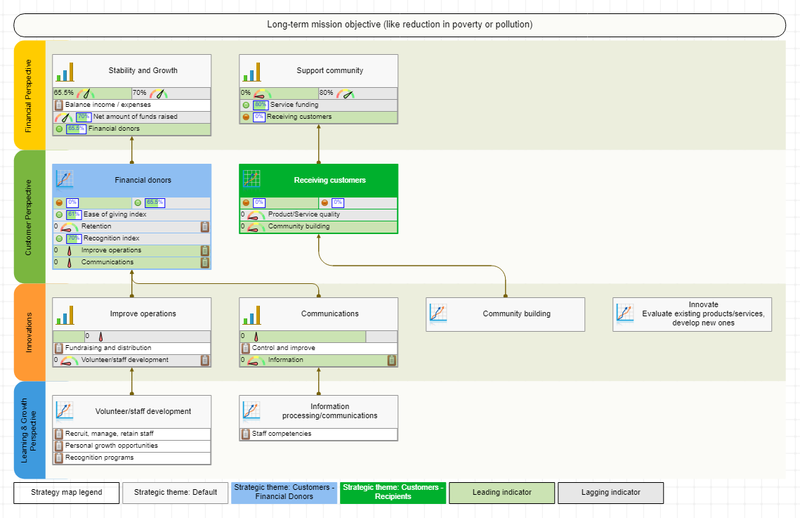 These are two most popular approaches to the BSC diagrams for non profits. There are a number of others as well, like renaming “Finance” perspective into “Success” or “Stakeholder interests”, or putting it on the same level with Customer perspective. A test question that one need to ask in these cases is whether the cause-and-effect logic is still trackable on such strategy maps or not. Customer perspective of the for-profit’s BSC, it was mentioned that customers are not only end-users of the product/service, but partners and other 3rd parties that work with a company. Such classification helps to define more specific goals for each group of the customers. Also, there might be mixed cases. Let’s take any professional community as an example with an annual membership fee, its members are both paying and receiving customers at the same time. Now, let’s build a Nonprofit Balanced Scorecard that will take into account the nuances described above. I’ll use BSC Designer Online as an automation tool. You can re-use the template that I’ll create to build your own scorecard. Nonprofits deal with two type of customers – financial donors and recipients. On the respective strategy map we might need to distinguish goals related to these two groups. For this purpose our team used a “strategic theme” function. Two other standard schemes – Operational Excellence and Product Leadership remained unchanged. On the next step, we prepared four BSC perspectives with proper descriptions. 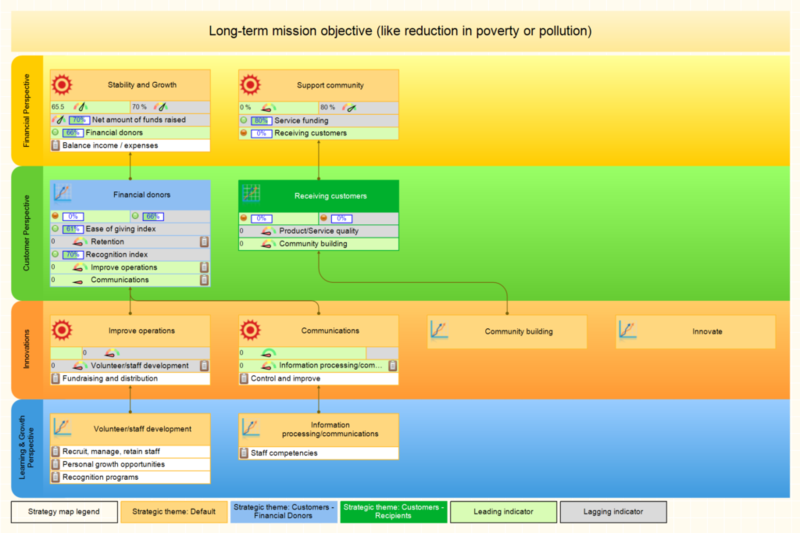 On the top of the diagram there is a long-term mission objective (like reduction in poverty or pollution). We have added some generic objectives to the strategy map. Each objective was assigned to a strategic theme, and cause-and-effect connections were specified. Finally, we aligned some initiatives and metrics with business goals. Let’s take the “Stability and Growth” objective from a financial perspective as an example to review. A leading indicator “Financial donors” is the result of the connection of this goal with the “Financial donors” goal from the Customer perspective (the lagging part of the Financial donors goal contributes as a leading indicator to the “Stability and Growth” goal). Check out this article to learn more about leading and lagging metrics. I believe we have reviewed the most important nuances about nonprofit BSC – the rest is very similar to what we discussed talking about classical BSCs. Nonprofit Balanced Scorecard discussed in this article as a starting template for your own scorecard! ^ Balanced Scorecard Step-by-Step for government and nonprofit agencies, Paul R. Niven, 2008, John Wiley & Sons, Inc.